In some ways, dogs are just like us. Certain situations can make them feel happy, sometimes they will feel sad, and often, they feel anxious. A calming collar for dogs can help soothe your pup when their anxiety kicks in, and you’re not around to give them some cuddles. There are various methods that calming collars can utilize in order to comfort your pup in stressful situations. Some use essential oils; others use herbs. Some work by releasing a substance that is very similar to the pheromone or chemical that mother dogs release to calm their puppies. Nothing says “You’re going to be okay” quite like mom’s pheromones! As much as we love our pups, we can’t always be with them to give them the attention and love they need to calm down in stressful situations. Calming collars do a great job of soothing their fears. Whatever the source of your pet’s anxiety, there will be something on this list that can help. Don’t forget, though, that none of these are guaranteed to work with every dog. All of them have success stories, and all of them have those few that didn’t work. Most likely, you’ll have to try a couple on before you find the best calming collar for your dog. You may also need to use other calming products along with it. Check out our top selection. 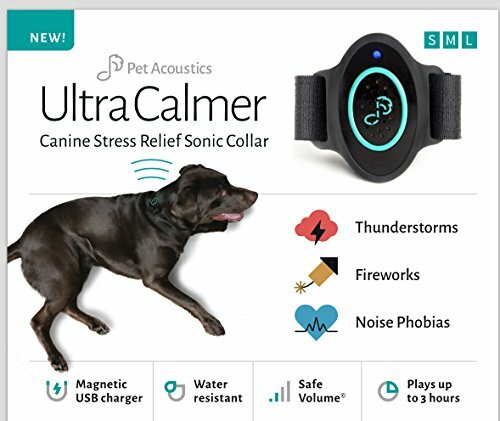 What Type Of Calming Collar Should I Buy? Adaptil is a brand that creates non-drug calming products for pets. 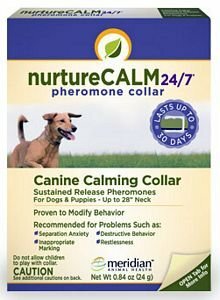 This pheromone collar is a non-intrusive, non-threatening, effective solution to lowering your furry friend’s stress levels. It works by releasing a “mommy dog” pheromone to soothe your anxious pup. Available in small, medium, large, and junior (especially for puppies! ), this one works no matter the size or age of your pet. The pheromone release is activated by your dog’s body heat, which means that it should start working effectively as soon as you put it on. 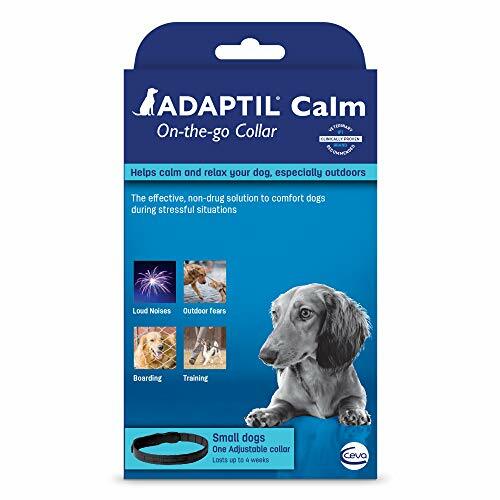 The percentage of dog-appeasing pheromones (DAP) in the Adaptil collar is between 2.5% and 5%, which is a high enough dosage to keep your pup feeling comforted and calm. 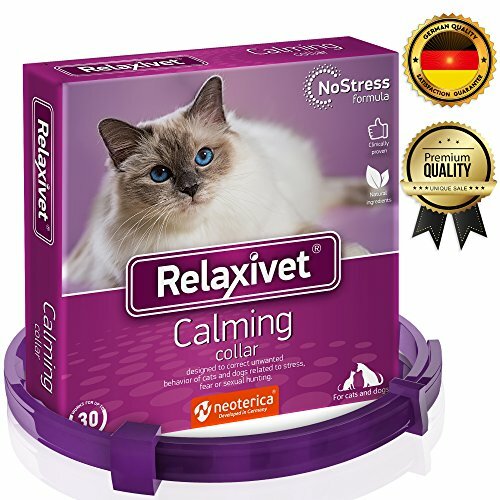 The Relaxivet is suitable for cats as well as small dogs. The active ingredient in this collar is a blend of chamomile and lavender for a subtle calming effect. Essential oils work well as they are natural and soothing. Depending on the size and sensitivity of your pet, though, it would be a good idea to pay particular attention to them initially to make sure they are not overly sensitive to the oils. 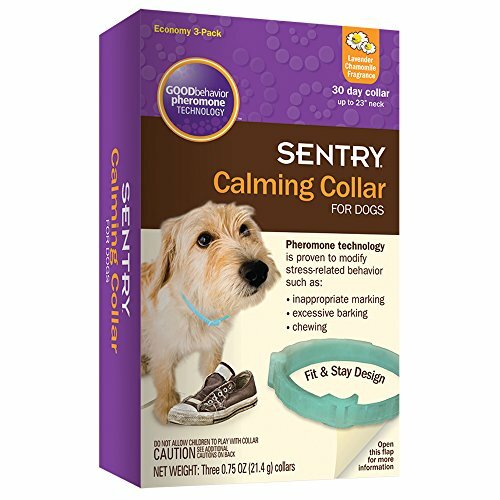 The SENTRY calming collar for dogs promotes better, calmer behavior by sending chemical signals to your pup in the form of pheromones similar to those produced by mother dogs to calm their puppies. This helps for signs of anxiety that arise in situations such as thunderstorms, fireworks, separation anxiety, or social situations. The collar has a lavender chamomile fragrance, which adds some extra calm. They fit dogs with a neck size up to 23 inches. The collar is not bulky at all, so if you take your pets for walks, you will either need to remove the SENTRY or have them wear it in addition to their normal collar. As these last a month or so before running out of mommy “smell”, it is a good plan to take advantage of the 3-pack. This makes it our top budget pick! Aromatherapy for dogs? Yes, please! This collar is not only all-natural and long-lasting, but it’s also pretty! There are designs and colors to choose from, and it’s softer and comfier than a lot of collars made from tougher material. Don’t let that fool you into thinking this one won’t last long though – as long as your pup doesn’t chew on it, the collar will last a good 3 to 4 months before you need to replace it. It’s filled with a variety of natural, dried herbs (lavender, chamomile, and balsam), all of which are quite safe for your pup and promote calm behavior. Just be sure to get the right size for your pup, and you’ll be good to go! The company goes out of their way to accommodate customers! This one is a little different to other calming collars out there. Instead of scent, this collar relies on sound to change your dog’s behavior. Pet Acoustics have created this collar to play tunes that appeal to a dog’s sense of hearing. Remember, canines hear things on vastly different frequencies to humans, and this helps for pups with a noise phobia. The collar’s speaker is designed to sit just behind a dog’s neck, so they can hear the soothing music easily and clearly. 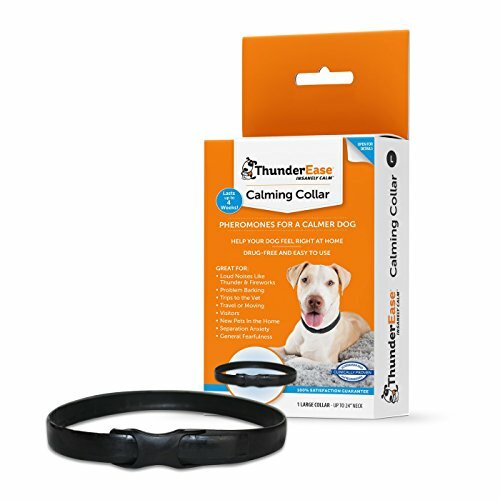 For pets who have a hard time dealing with thunder or fireworks, this collar almost immediately has an effect on reducing stress. A calming collar for dogs is quite different to a training collar. While these collars aim specifically to reduce stress, “shock” collars that are used for training have quite different mechanics. With the variety of products on the market, it can be confusing when it comes to deciding which would be best for your dog. As you will have seen going through this list, collars can use many methods of calming. Pheromone collars are popular. Other types include essential oil collars, herbal collars, and ones that use sound therapy. This is something to consider no matter what product you’re buying for your pet. Some collars work best for small dogs, some are fine for pets of all sizes. By this, we mean the ease with which the collar will fit into your pet’s everyday life. If you take your pet to the park a lot, you will need a collar that fits comfortably without getting in the way of a harness and leash. Remember, this is supposed to be making your pet’s life (and yours!) easier, so convenience is definitely a factor! Collars can be scented or unscented. Often, a pheromone collar will also be scented with essential oils to add an extra little boost of calm. This really comes down to personal preference – both of pets and pet owners. Pheromone collars vary in how much pheromone they use. They range from 0.02% up to 5 or 6%. The best amount really depends on the pup and how they respond to it. It’s better to start off on a lower dosage, and up it if your pet doesn’t respond to it. Perhaps your pup doesn’t enjoy wearing a collar, or maybe having something around their neck makes their anxiety worse. There are other calming aids out there that can also help with reducing anxiety and improve your dog’s behavior. Often, dog owners are recommended to use one of these in conjunction with a calming collar to get the best results. All dogs love a tasty treat, and if that treatment helps reduce stress, then all the better! Calming chews are a great way to give your pet a little extra calm and a little extra love at the same time. Check out these Calming Bites by Zesy Paws, The Joy of Calm treats by Zingy Paws, and these Hemp Treats by Highlawn Naturals. If you are skeptical of all the latest fancy treats on the market, you may already have one in your cupboard that your pup will love – peanut butter is also a great calming treat and will keep your pooch occupied for a good long while. If you like the idea of aromatherapy and essential oils for your pet, but you (or they) aren’t keen on getting a whole new collar, you can get your pup a diffuser. It’s always a good idea to make use of oils that are specifically designed for pet use. Essential Oils by Zen Doggie and Energize by Flippin Happy Pets are two good examples. When it comes to actual diffusers, Adaptil has a good one for home use. The other option is to get a small, portable diffuser that hangs on your dog’s collar. This not only helps with their anxiety, but it looks cute too! Check out this pendant from Izzybell Jewelry, or this bone-shaped stainless steel locket by Essential Oil Innovations. Great for doggie birthday gifts too! Sprays work the same way as essential oil diffusers, except you will need to actually spray it manually. These are good for those times when you might need to leave your pet alone for a while. Simply leave a spritz or two on your pet’s pillow or a piece of cloth nearby, and the essential oils will get to work. Never spray directly at your pet! Check out Peaceful Pet’s aromatherapy spray, and Shooting Rainbows’ Peaceful Pup Spray. Have a look at the Bach Rescue Remedy spray, too. Wraps and jackets can be highly effective at calming down pups with anxiety-related behavioral problems. The jackets act kind of like a hug, providing a constant gentle pressure which can be very soothing for freaked out pups. They typically fit any breed of dog and are usually sized around the chest area. For stylish and effective anxiety relief, consider getting your pup a Thundershirt, or an American Kennel Club Calming Coat. vomeronasal organ, which is located between your pet’s mouth and nose. How do pheromone collars work? Pheromone calming collars contain an amount of synthetic pheromone that is released when warmed up by your pup’s body heat. The pheromone used in these collars is the one given off by mothers to calm their babies. When this is released, your pet immediately picks up on these pheromones and their body reacts naturally, calming them down. Are pheromone collars safe for my pet? Absolutely. 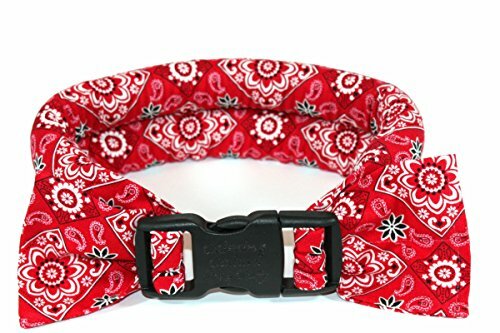 These types of collars have mostly positive reviews, and no records of being harmful to pets. Essential oils in the right quantities are generally perfectly safe for dogs. Cats tend to react badly to lavender, so be aware! Pet owners should, however, monitor their pet’s reaction to essential oils and if they show any adverse signs or symptoms, remove the oils as soon as possible. Should I use anything in addition to the collar? 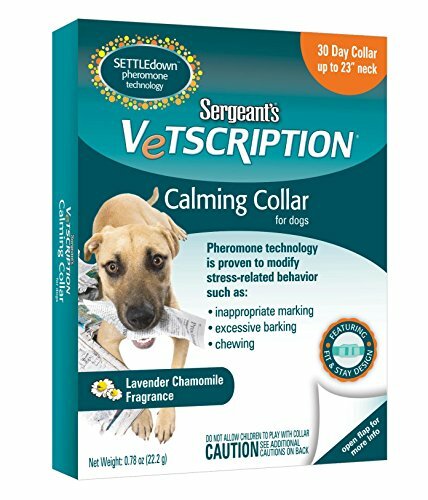 While the collar alone can be beneficial, it is recommended to use it with something else, such as calming treats. ThunderShirt is a well-known name in the pet anxiety product world. While they are most renowned for their pup jackets and wraps (as the name suggests), they have also created their own calming collar. This pheromone collar is sleek, drug-free, and effective. As with others, it releases the comforting mommy-pheromone upon activation by your pup’s body heat and will continue releasing it for up to 4 weeks before needing to be replaced. This is a light, small dose pheromone collar for minor anxiety. Smaller dosages may not work as well for larger dogs. A lavender scented pheromone collar that is listed as having 6% DAP. If your dog behavioral problems that are related to anxiety, both you and your pup may benefit from a calming collar for your dog. Whatever type of collar you choose, remember to use it in conjunction with other effective calming aids and plenty of positive reinforcement. When it comes to changing animal behavior that is rooted in fear, you are the biggest factor. The support and love you give your dog make all the difference! Sure, get your pup a calming collar to help when you aren’t around to give him the love he needs. But remember – especially when dealing with an anxious dog – patience, caring, and plenty of nurturing make all the difference. Have you and your furry friend had success with a calming collar for dogs? Any advice you can share? Let us know in the comments!